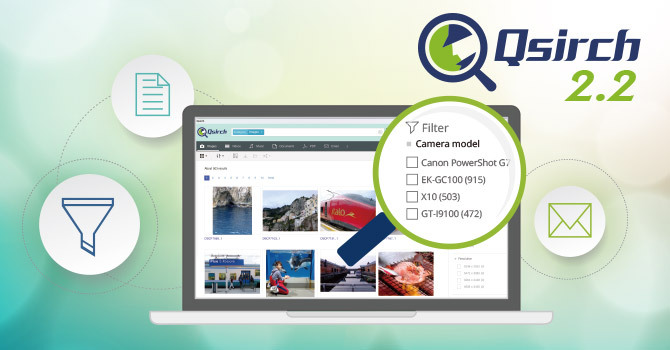 Taipei, Taiwan, July 20, 2016 – QNAP® Systems, Inc. today released the upgraded Qsirch 2.2 that adds the following features: personalized filters for improved search accuracy, enhanced email search for efficient management of stored emails, and document previewing for a better browsing experience. Qsirch is an exclusive search engine developed by QNAP. It supports over 6,000 file types to assist users in finding specific files stored on QNAP NAS within seconds. “To complement QNAP NAS as a huge data center, ‘searchability’ is one of the key areas for increasing the value of stored data, and Qsirch is the best tool to realize optimized search capabilities for vast data storage and archiving,” said Cherry Chen, Product Manager of QNAP. The personalized filters in Qsirch 2.2 help to locate files with greater accuracy. Users can flexibly choose search criteria for different file types. For example, photos can be filtered by camera model, resolution, or focal length; music by artist or album name; documents by creator, and more. Qsirch 2.2 also provides a powerful email search. Users can customize search criteria (such as date, carbon copy, sender, and receiver) to efficiently search through .eml files and find specific emails stored on the NAS. Using Qsirch with QNAP’s email apps can make searching through and managing massive amounts of emails much easier. In addition to multimedia and email searching, Qsirch 2.2 strengthens its built-in data previewer for document reviewing. Google Docs™ and Office Online® are now available to directly review searched files, and to provide a better user experience. Qsirch 2.2 is now available from the QTS App Center. The Qsirch Helper Chrome extension is available from the Chrome Web Store. System Requirements: x86-based NAS models require at least 2GB RAM; ARM-based NAS models require at least 4GB RAM. Firmware Requirements: QTS 4.2.0 (or newer). For more information about Qsirch, please visit https://www.qnap.com/solution/qsirch/en/.